Beauty brand LaRoche-Posay is swapping ahh-glamour for aww-cuddles with its new global “#Skinchecker” campaign. 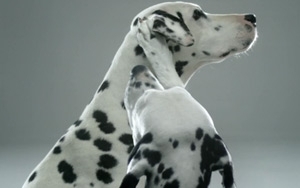 Featuring some of the world’s most photogenic Dalmatians, a video follows the pooches as they lovingly check out each others’ spots, playing with the insight that many women are more apt to check for signs of skin cancer on loved ones than on themselves. The campaign for the L’Oreal-owned brand, scheduled to break in the U.S. next month, also uses results of an IPSOS survey in digital and social elements to educate consumers about disparities in skin protection between men, women and nationalities. (The poll is based on responses from more than 19,000 people in 23 countries.) BETC is the ad agency. Besides a social-media push and the hope that the monochromatic pups are enough to take the video viral, it also includes downloadable information on the ABCDEs of skin cancer, the five-point checklist dermatologists recommend when self-checking moles.